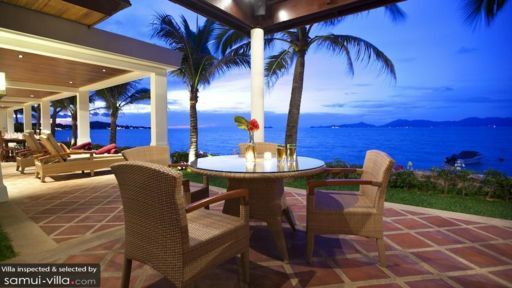 Villa Hibiscus on Samui’s Mae Nam beach is a mesmerizing property right at the edge of the beach, providing full access to the white sandy shores and dazzling ocean. Dine in style right beside the water while overlooking the stunning horizon in the distance. A swimming pool that resides in the garden also provides enviable views of the ocean. The villa hosts four bedrooms found in two adjacent pavilions as well as living and dining spaces facing the panoramic beauty of the island! Villa hibiscus is home to four bedrooms, two of which are furnished with king-sized beds, and two are furnished with single beds. Found in adjacent pavilions, the bedrooms open out to the garden area that leads to the pool for easy movement for all. They feature wooden flooring, intricate artwork, and modern furniture all found under a traditional, high-pitched ceiling. The bedrooms have televisions to keep you entertained, in case you wish to lounge and chill. Each of the four bedrooms has an en-suite bathroom that has been fitted with walk-in showers, and other amenities. The beautifully landscaped gardens at Villa Hibiscus are flush with nature including dense bushes, tall trees, and manicured grass that is dewy in the morning. The swimming pool is L-shaped, with one end looking straight towards the ocean. Sun chairs can be found on the pool deck for you to lounge upon after a refreshing dip. 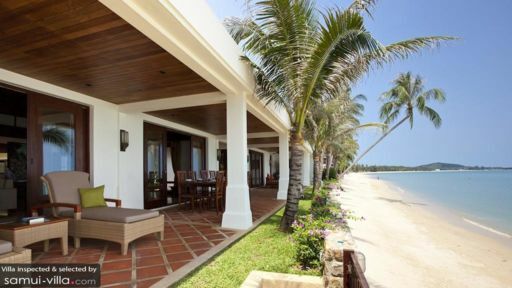 A traditional Thai sala fitted with ceiling fans is furnished with rattan seating as well as a daybed for lounging as this setup is right next to the beach. There are chairs that face the ocean as well, so guests have ample space to fully breathe in this spectacular view. Enjoy a meal alfresco on the outdoor dining table with family and friends. The homely poolside living area at Villa Hibiscus is easily accessible through sliding glass doors from the deck. The ceiling is high-pitched in a traditional Thai fashion and the interiors are a blend of the old and new. The comfortable sofas are facing a flat-screen TV which is accompanied by a DVD player so you get to enjoy watching films etc. The living room is well-lit owing to abundant sunlight streaming indoors, and you will find it to be airy and breezy. There are two dining options for guests including the alfresco dining on the porch beside the beach. There is another more formal dining area indoors in the living room with an eight-seater dining table for the convenience of guests. The luxe decor is heightened due to the wooded interiors in the living room. The fully-equipped, modern kitchen is spacious and even features an island in the center. There are state-of-the-art facilities including modern appliances and amenities for your use! With friendly and kind staff to look after you, the villa is perfect for a relaxing holiday as there is not much you need to do to have a grand old time. You are offered a complimentary breakfast to start off your day with a bang. Other services like bicycle and car rentals, meal preparations, laundry, massages are all charged extra and available upon request. 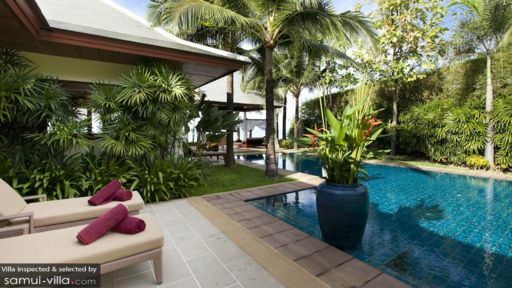 The villa is ideally situated close to both Mae Nam beach and Bophut beach perfect for swimming and other water activities including scuba diving and kite-surfing. Several restaurants offer local and international delicacies that you can try out such as The Boudoir, Angela’s Restaurant, and especially Namu that is found at the tip of the ocean. Explore the Eco Safari Tour to try out a horde of outdoor activities!